He honked the horn of the bus. I ignored him, and opened the trunk of my car. He smirked, gestured, and beeped a second time. I hoped he wasn’t trying to get my attention. For women in this part of the world, it’s not unusual to receive some level of rudeness from random guys; but this bus driver was with the Young Leaders group that day. Three busloads of teenage boys, five local teachers, and I had come to the beach that morning for a field trip. 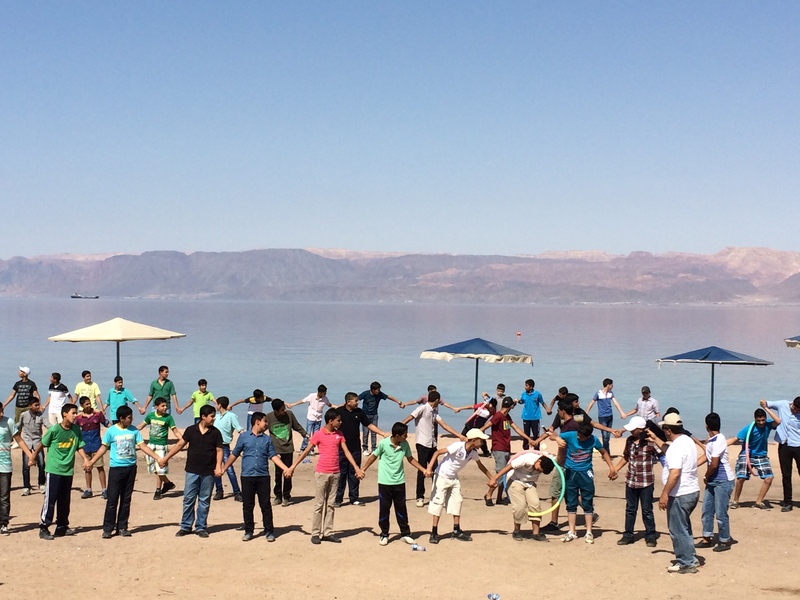 The students were finishing the last of their “team building” games, just a few minutes behind schedule. Earlier that morning, they had combed the beach for sea glass, which women who are employed at the community center would later transform into jewelry. I packed the glass in the trunk of my car, and the bus driver beeped again. “Hurry up!” he yelled in Arabic. “We’re waiting. Let’s get going!” His abruptness led the thought to flash across my mind: Is he intoxicated? Out loud, I apologized, and told him I would get the boys moving onto the buses. Given that drinking was against his religion, it was 11:00 a.m., and he was a bus driver, I dismissed my previous thought as preposterous. I told Ramsey, one of our Young Leaders teachers, that our bus driver wanted us to hurry up. The boys got into the buses while Ramsey went to see what the rush was about. I thought I heard wrong. I asked him to repeat himself. We needed to figure out, quickly, if this guy was under the influence, endangering students– in which case my instinct was to pull him out of the bus, leave him in the blazing sun on the beach, and replace him behind the wheel with one of our trusted teachers– or if he just had little social aptitude and a poor choice of cologne. What to do, with so much at stake? And with so much, from hometown colognes to cultural methods of confrontation, beyond my knowledge? We came up with a plan, but all I could think about on the drive home was, How do I make sure this vulnerable scenario never. happens. again? Last week, my best friend from this city, Sammi, was telling me again what she hoped God would provide in her future husband, though she had no current candidates. She is helping me with my Arabic, and our “studying” often turns into conversations about heart and soul stuff. The following day a family who had heard of her came to visit– unexpectedly. By the end of the evening, they had asked her to marry their son. The two met that night and signed the marriage contract the next morning. But on a deeper level, when I saw my close friend Sammi, joining her hands and connecting her life with this almost-stranger, I knew I didn’t understand. When we lead, when we love, or even when we simply talk, or connect with one another, the risk is present: of not understanding. Or, what is an even less appealing option to some of us: of not being understood. Sometimes the stakes are low. I recently tried to ask one Young Leaders teacher, in Arabic, Do you know how to cook? It came out, Do you know how to get engaged? Sometimes the stakes are higher. A bus full of students. A friend who needs support even if I can’t understand the road she is traveling. When the stakes are raised, but the guarantee that I will understand and be understood is not there, my tendency is to reduce risk factors as much as I possibly can, and try to increase safety. I put my hands in fighting stance, or attempt to put distance between what I love and what I feel is a threat. But, in fight or in flight, many times I’m also guarded against good things. Deepening relationships. New experiences. Trust. After Sammi told me her news, I went to Dana, my wise friend from this city, for help in wrapping my mind around their quick commitment. What’s the best way for me to support her? I asked. Dana asked if there would be an engagement party. She smiled, knowingly. The best way, though I don’t fully understand what happened previously or know will take place in the future, to be fully present and engaged? ***Song to this story is Counting On, by John Mark McMillan.